From left: John Bartlett, executive chairman of APH; Chris Johnson, store manager at Sauk Rapids Auto Value; and Corey Bartlett, president and CEO of APH. 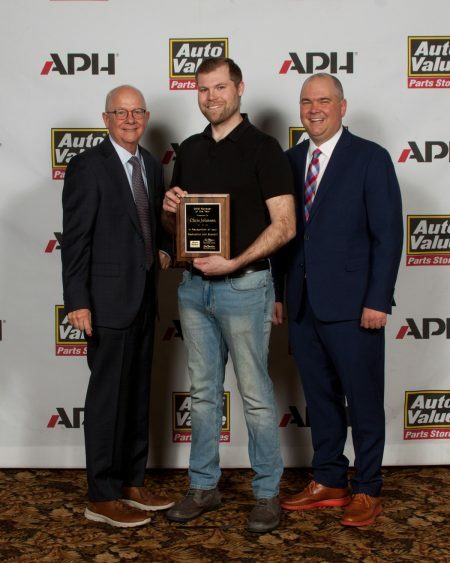 APH named Chris Johnson as the recipient of the 2018 Auto Value Store Manager of the Year award. Johnson is the manager of the Sauk Rapids Auto Value parts store. He was recognized during an awards banquet at APH’s annual Winter Conference on Monday, January 21, 2019 at Cragun’s Resort and Conference Center in Brainerd, Minnesota. Johnson has been a part of the Auto Value team since 2012. When not at work, he enjoys spending time with his wife, Tammy, and their three children.